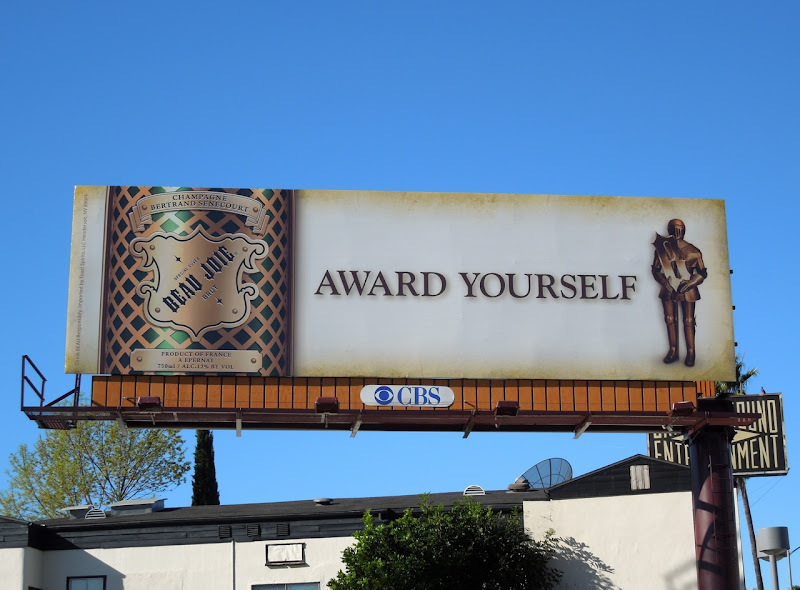 There's nothing like a glass of champagne to ring in the New Year, so here's two billboards from Beau Joie to toast the end of 2011 and welcome 2012. This relatively new luxury champagne comes in a special copper suit of armour, hence the slightly corny 'Own the Knight' creative. 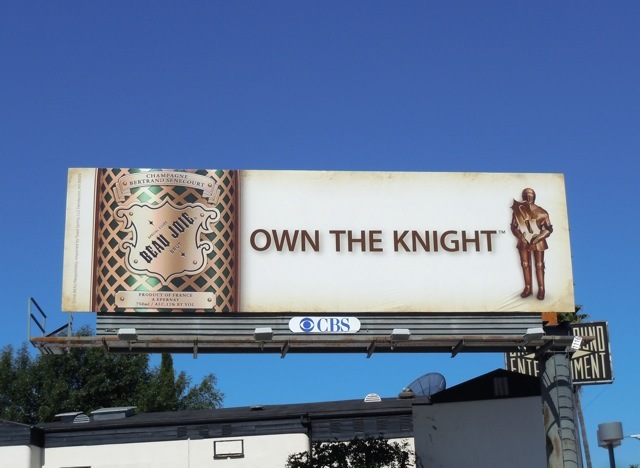 The 'Knight' version was snapped on July 1 and the second billboard featuring the Brut and Brut Rosé bottles was captured in the same location, along Sunset Boulevard at La Brea Avenue, later this year on October 26, 2011. Happy New Year's Eve. Enjoy the day's festivities however you chose to celebrate it. 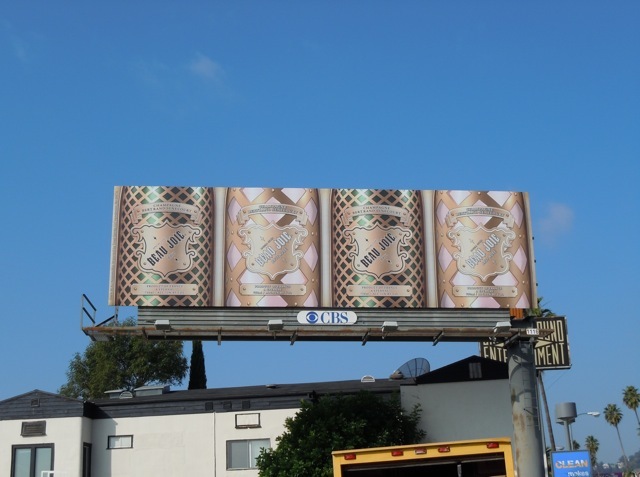 UPDATED: Interestingly it looks like Beau Joie decided to see in the New Year with a new billboard creative. 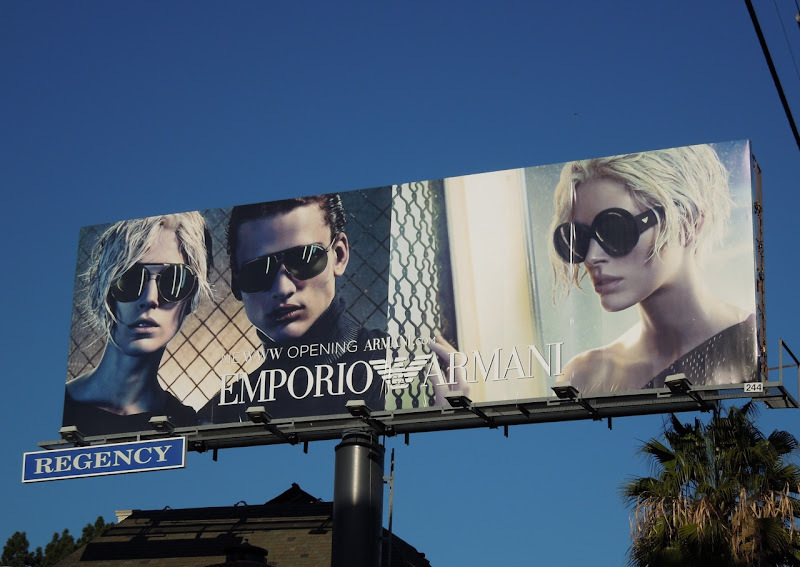 This 'Award yourself' ad was snapped in the same location as the previous versions on January 5, 2012.
Who has the chicest sunglasses this season, that's the question these billboards by Emporio Armani and Michael Kors pose. 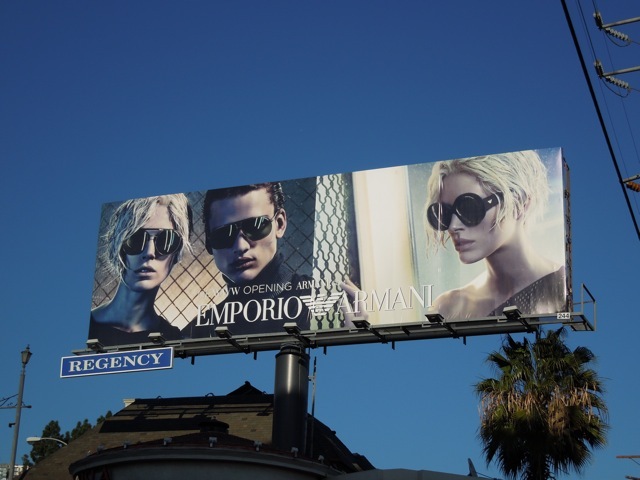 The Emporio Armani eyewear ad continues the fashion brand's striking Fall Winter 2011 campaign, whilst not to be outdone Michael Kors promotes his sunglasses and wristwatches in time for the gifting season further East along Sunset Boulevard. 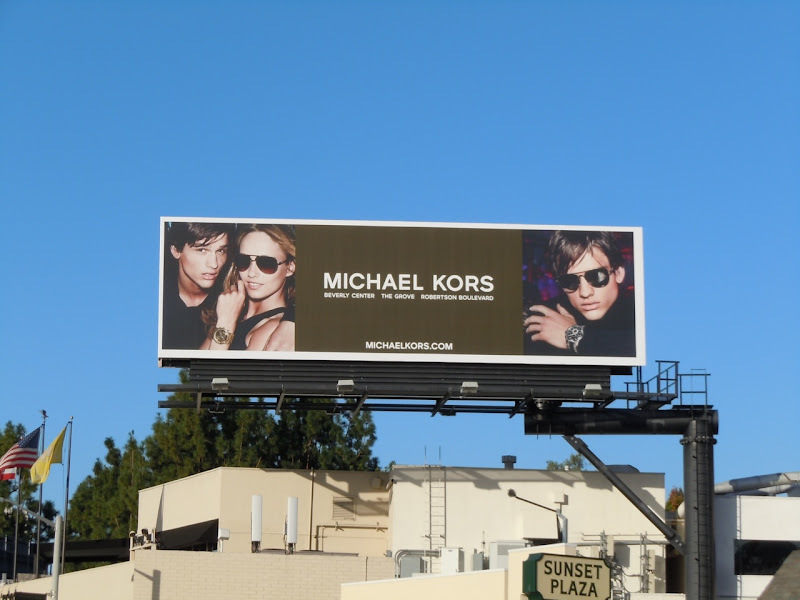 The Michael Kors ad was photographed along Sunset Plaza on December 2, whilst Emporio Armani's latest creative was snapped along Sunset Boulevard at Holloway Drive on December 9, 2011.
Who do you think should win this particular Battle of the billboards? 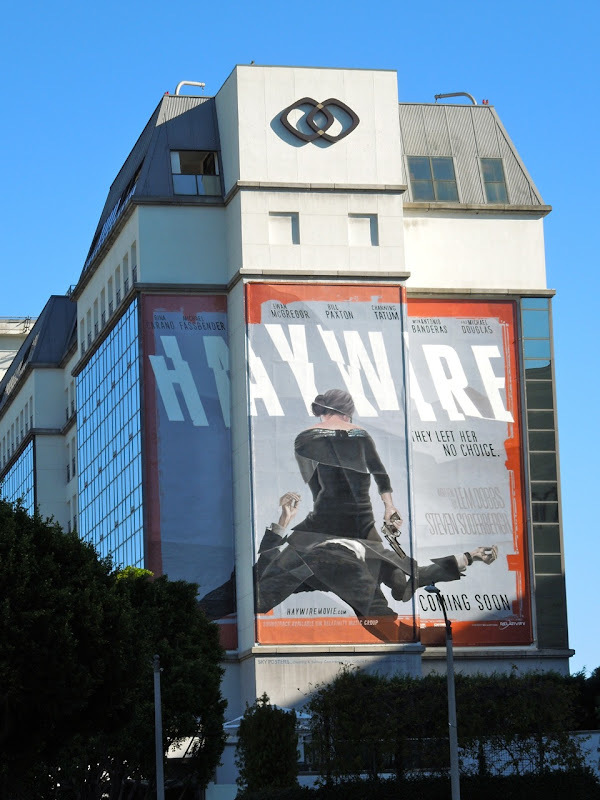 In Haywire, Gina Carano stars as a black ops super soldier out for payback after she is betrayed during a mission. 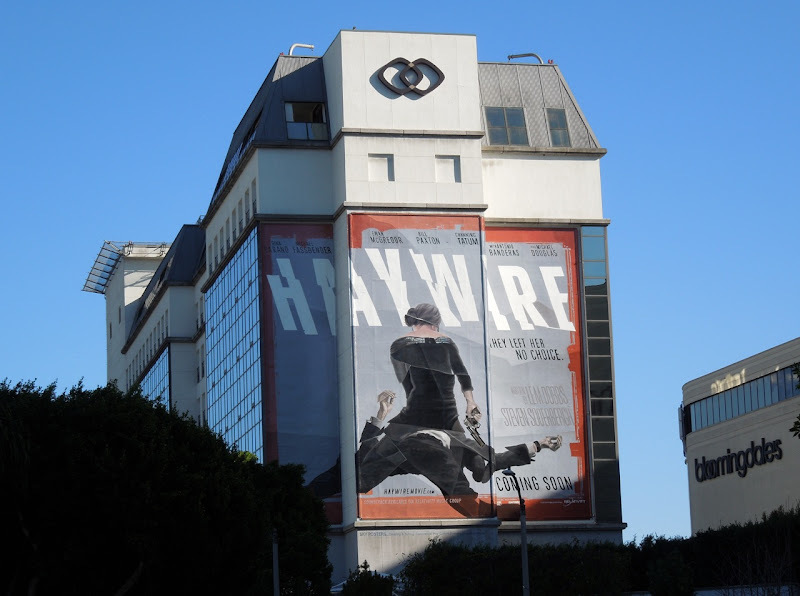 The former television American Gladiator plays 'Mallory Kane' on the big screen and as she's not an instantly recognisable face, this giant billboard works well to convey the action in the movie and pique passersby interest with its edgy, fractured design. 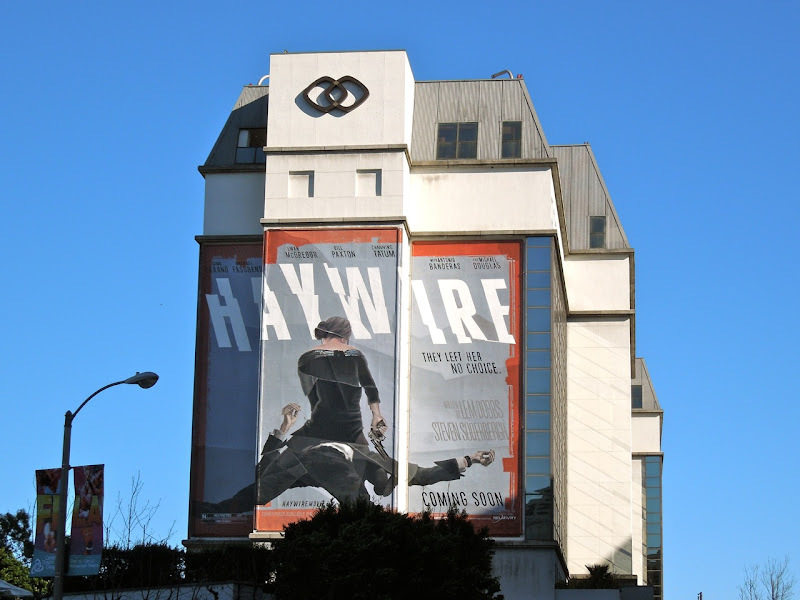 This super-sized movie billboard was snapped on the side of L.A.'s Sofitel Hotel along Beverly Boulevard on December 22, 2011. The New Year is usually reserved by film studios for the movies they don't have much faith in or have been languishing in development hell for years. 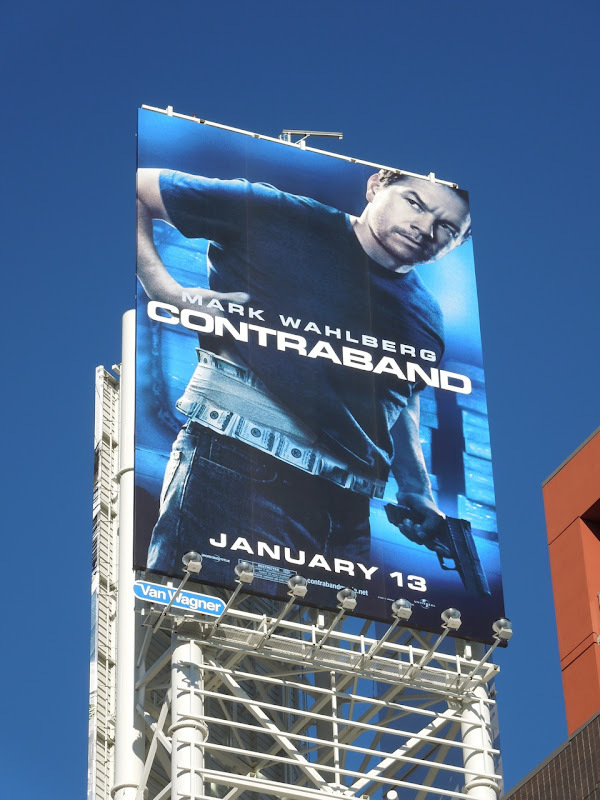 Let's hope that's not necessarily the case for Mark Wahlberg's new action thriller, Contraband. 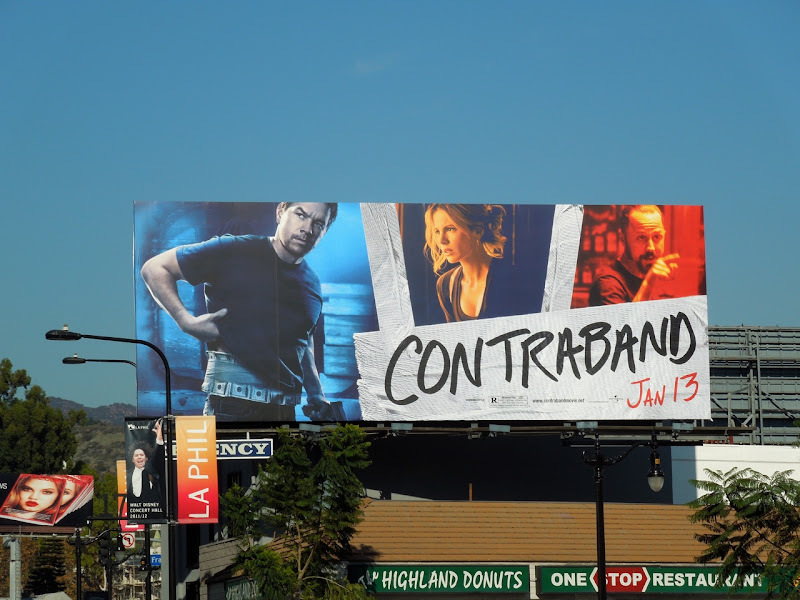 At least the billboard isn't a complete failure and the blocks of primary colours really work to make the ad stand out, whilst Mark Wahlberg lifting his shirt to reveal the money hidden underneath helps convey the smuggling theme of the film. 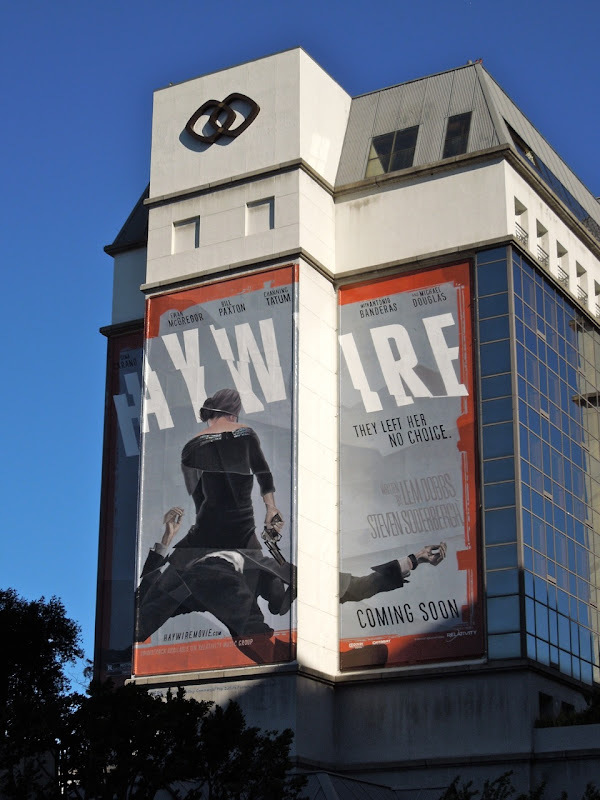 These billboards for the movie were snapped along Beverly Boulevard and Highland Avenue on December 20, 2011. 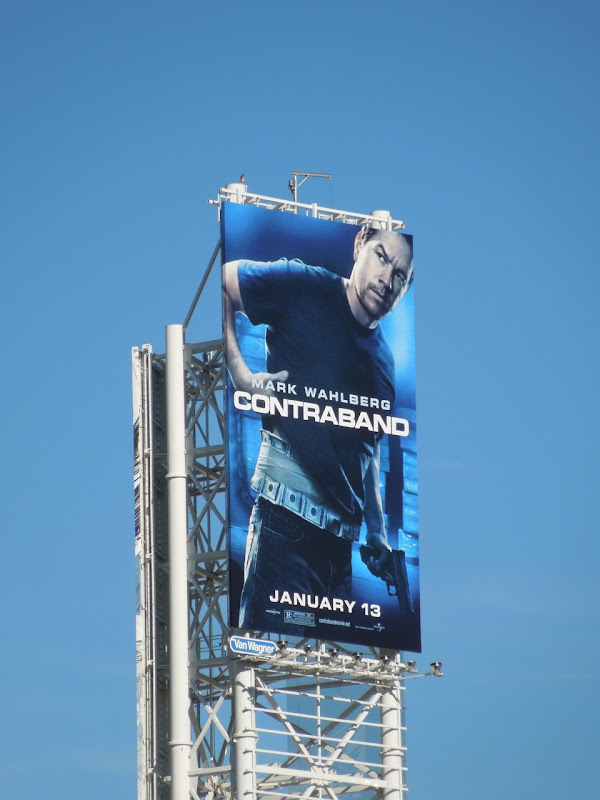 UPDATED: Here's another creative for the movie with a solo Mark Wahlberg, snapped along Vine Street in Hollywood on January 2, 2012. 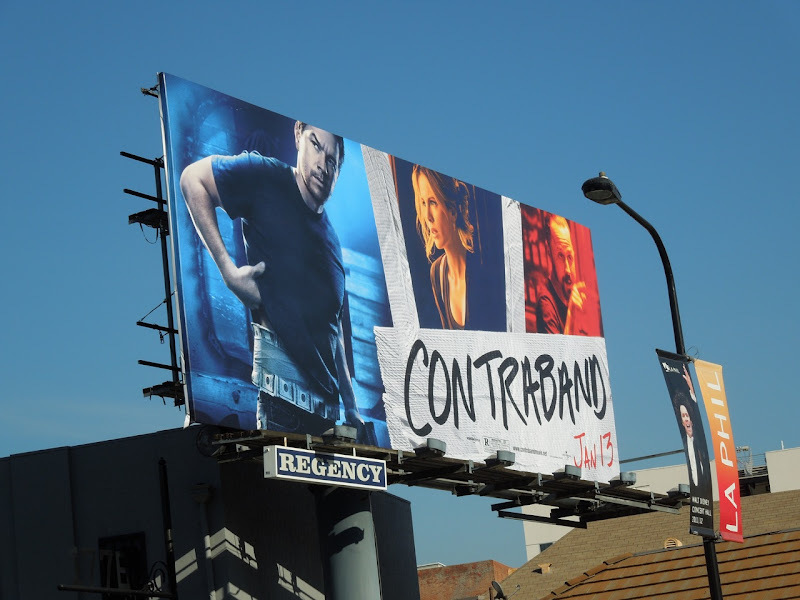 Daily Billboard laughed out loud when reading 'The Bullseye' section of the January 6, 2012 edition of Entertainment Weekly when they remarked on the poster for the movie - 'Mark Wahlberg stars as a former smuggler who returns to a life of crime to rescue his brother-in-law. But first he must scratch his back'. Funny. 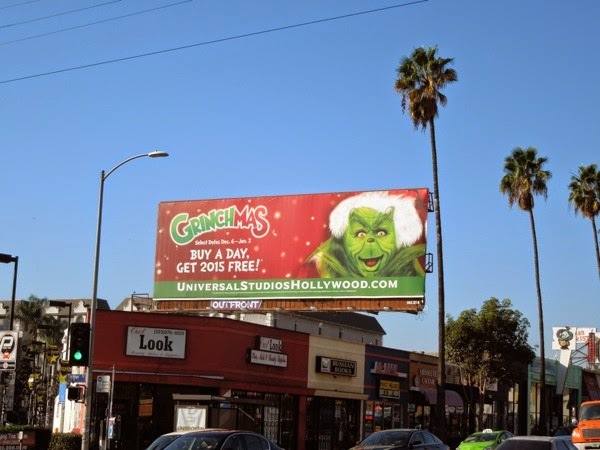 Adult Swim brought some irreverent holiday spirit to Sunset Boulevard this season with this fun billboard. Promoting itself in the form of a personal ad, the channel continues to surprise and entertain. 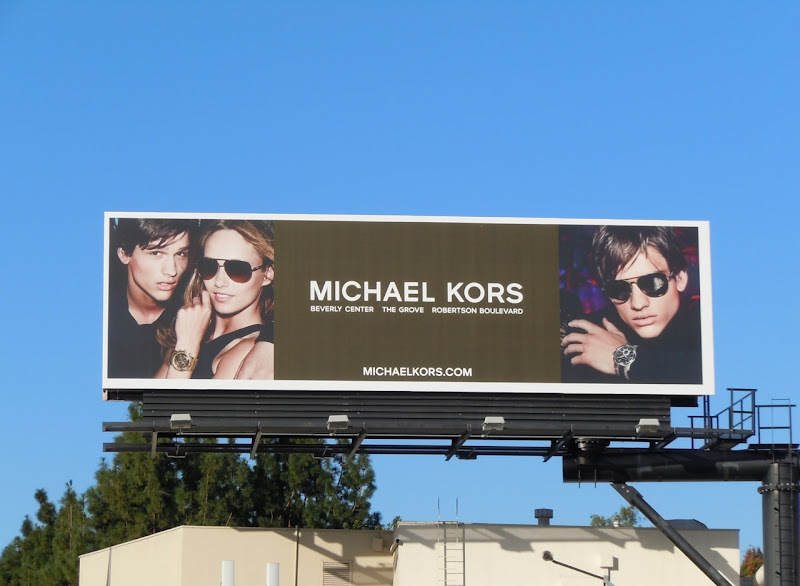 This billboard was snapped in its usual location in West Hollywood on December 16, 2011. Be sure to check out some other Adult Swim billboards from this year, including these Squidbillies and China, IL animation billboards, the NTSF:SD:SUV billboard, Superjail! 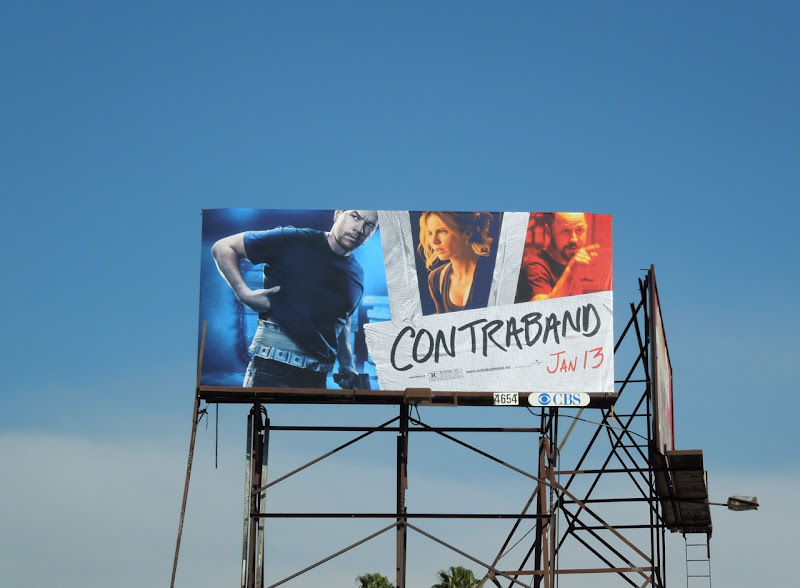 season two billboard and more. Here's a festive treat for you, a ghost of movies past. Even though The Spirit was a huge Christmas box office flop, they did have a great marketing campaign. 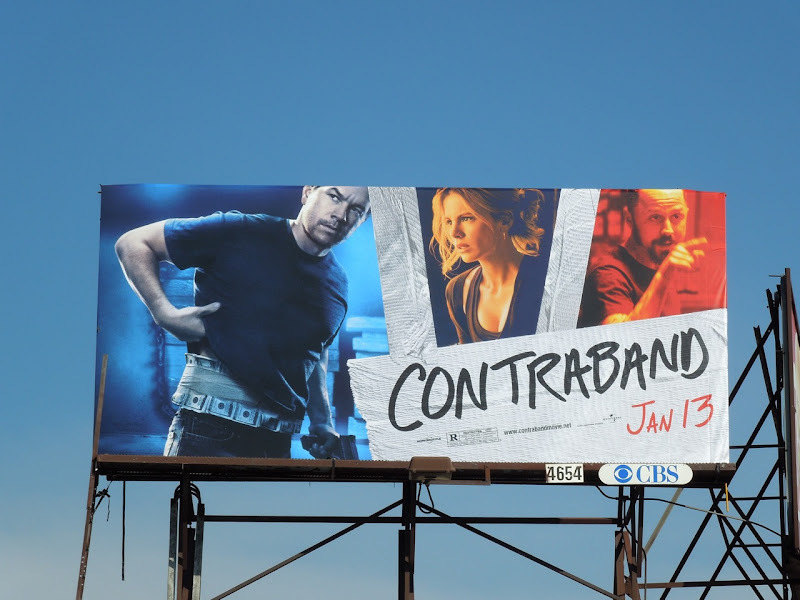 Sadly not even the witty sexual innuendo laden billboards could save this movie. 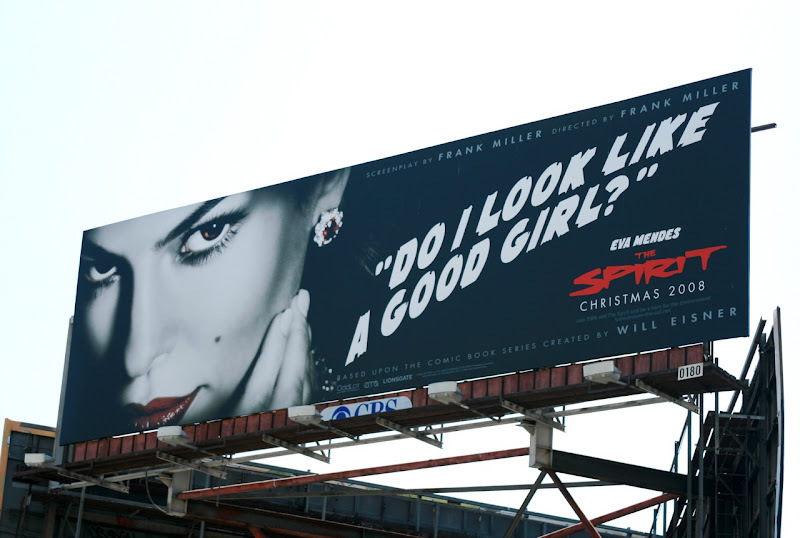 These billboards starring Scarlett Johansson and Eva Mendes were snapped along L.A.'s Sunset Strip on August 15, 2008. You can see more Eva Mendes billboards for Calvin Klein here at Daily Billboard. What's Christmas without Santa Claus, and what's Grinchmas without a green-furred, grumpy Grinch? 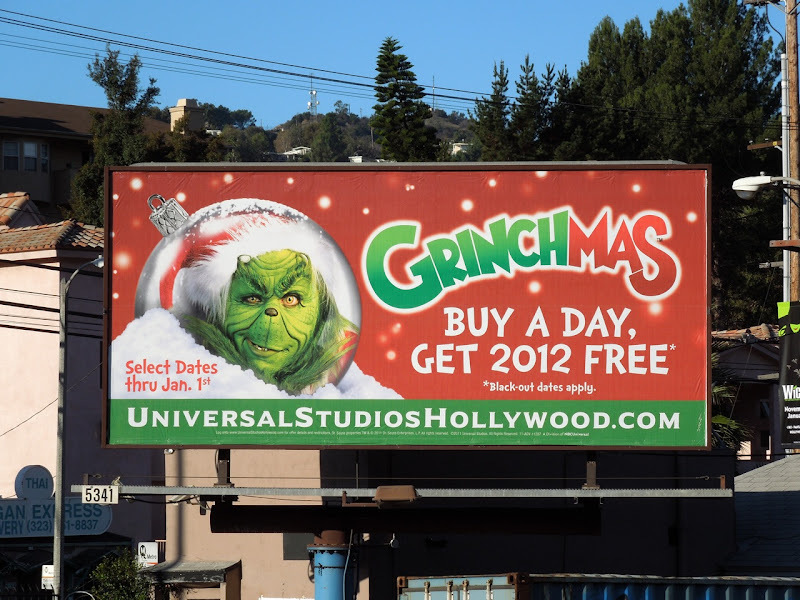 Wherever you are, have a very Merry Christmas, and if you are enjoying a day at Universal Studios Hollywood today, have a Happy Grinchmas too. 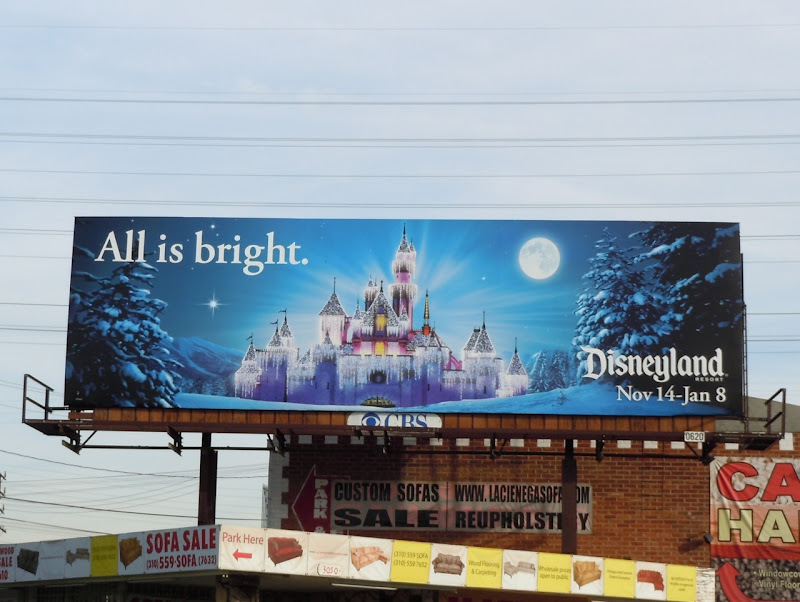 This festive theme park billboard was snapped at Cahuenga and Barham Boulevards on December 10, 2011. If you're a fan of the movie, be sure to check out these original props, mask and models from How the Grinch Stole Christmas on display. 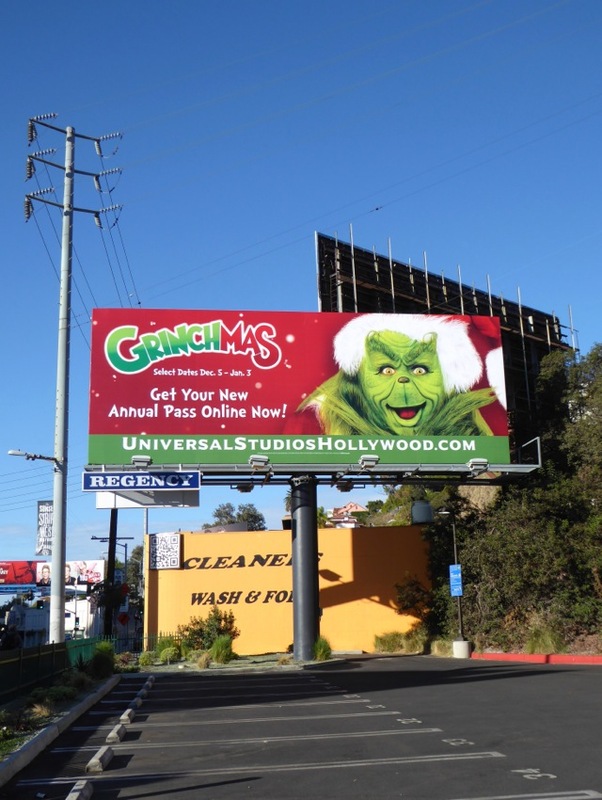 UPDATED: The Grinch is back for another holiday season at Universal Studios Hollywood and he's back recycling virtually the same ad campaign from previous years (but if it's not broken, why fix it right?). 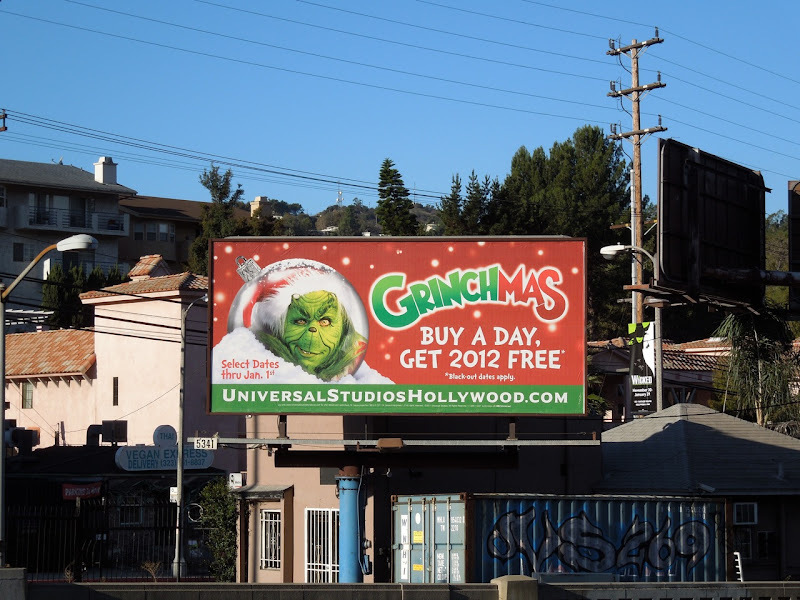 This festive Grinchmas billboard was spied at the corner of Melrose and Highland Avenues on December 5, 2012. 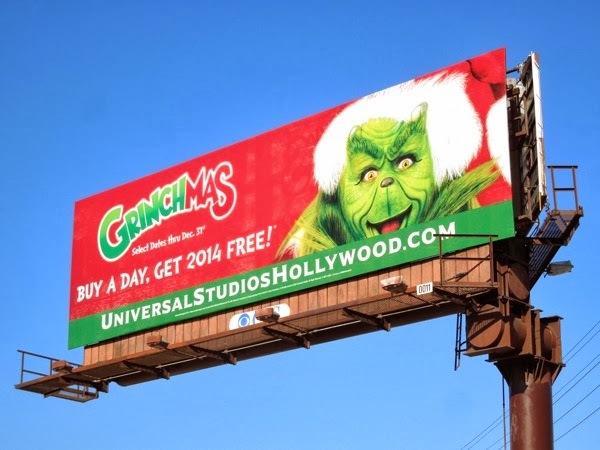 UPDATED: It's that time of the year again and that pesky Grinch is back to dispense his unique brand of Christmas joy at Universal Studios Hollywood. 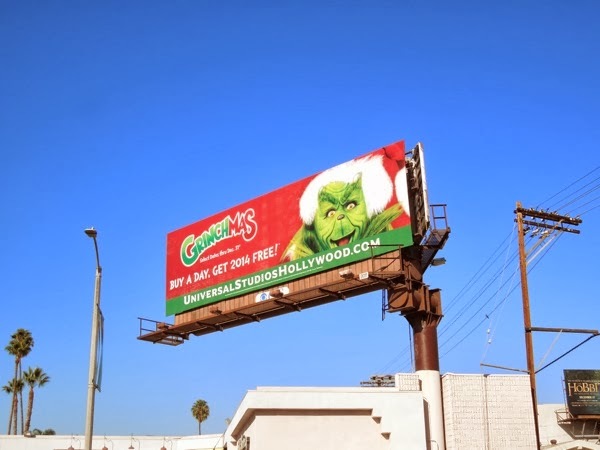 Here's the updated Grinchmas 2013 billboard spied cheering up the skies along Beverly Boulevard on November 25, 2013. 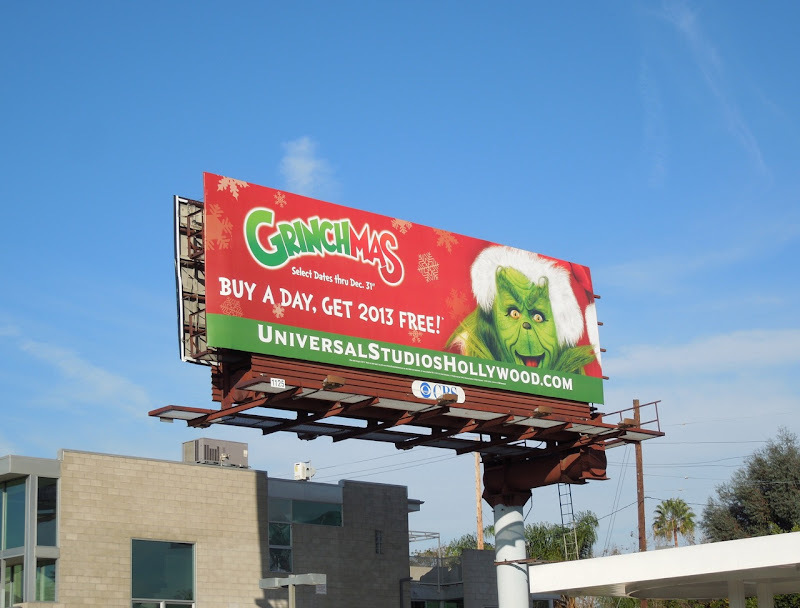 UPDATED: And here's the familiar Grinchmas creative for Christmas 2014 spied along the palm tree-lined Sunset Boulevard on December 6, 2014. UPDATED: What's that saying? Familiarity breeds contempt. Whilst it's nice to see The Grinch beaming out from these Universal Studios billboards each year, there's something to be said for refreshing a creative every other year or so. 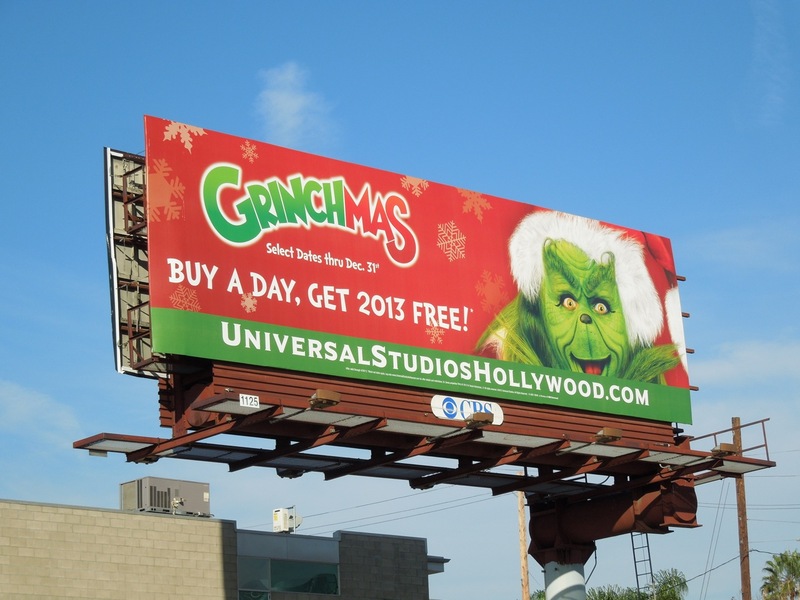 This 2015 Grinchmas billboard was snapped along the Sunset Strip on November 27, 2015. 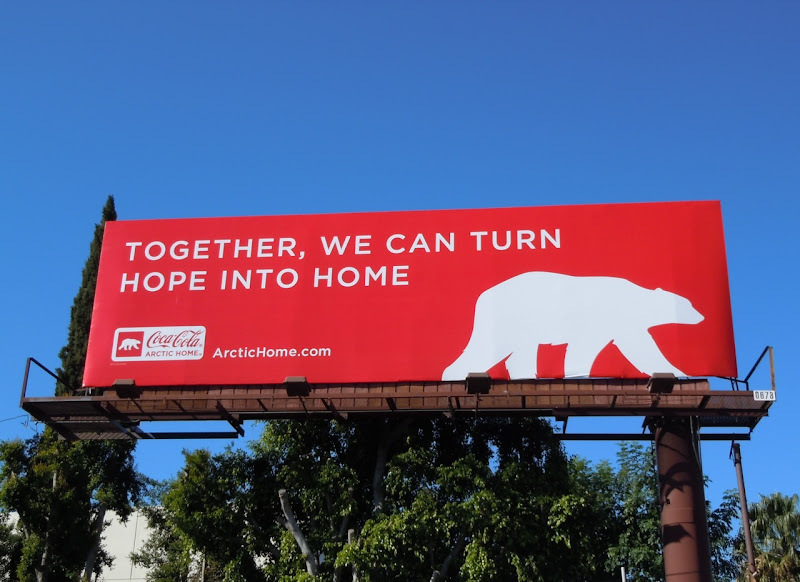 Those keeping their eyes open for Coca-Cola's jolly Santa billboards this year may be a bit disappointed, but Coke seems to want to do its bit for a worthy cause instead this Christmas and help polar bears in the wild (who are often featured in their holidays advertising). 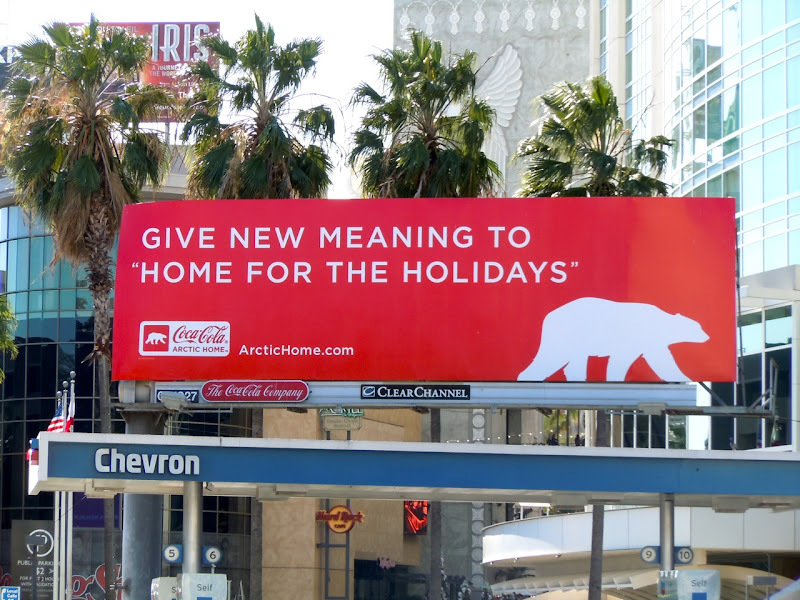 These festive Arctic Home billboards still do a great job of screaming Coca-Cola, with the familiar red and white colours making the brand instantly recognizable. 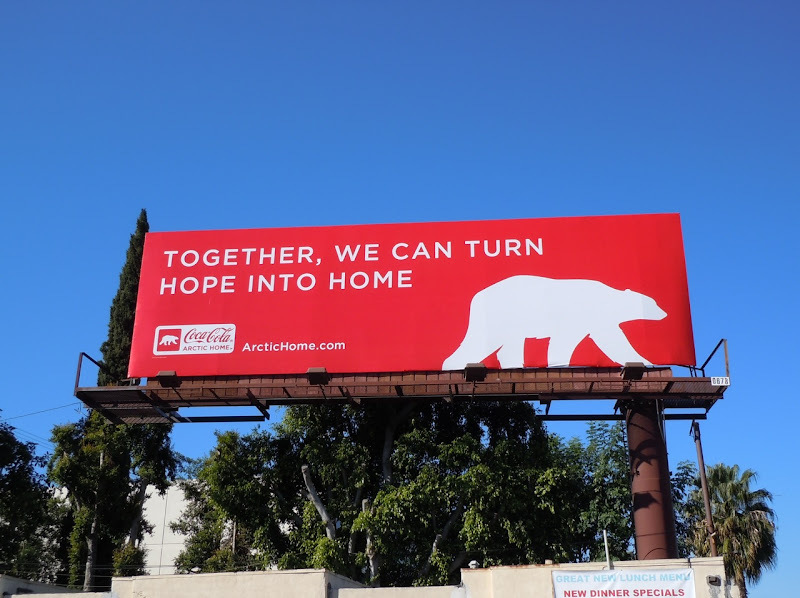 The 'Hope into home' creative was snapped along Ventura Boulevard in Studio City, whilst the 'Home for the Holidays' version was photographed at Highland and Franklin Avenues on December 5, 2011. 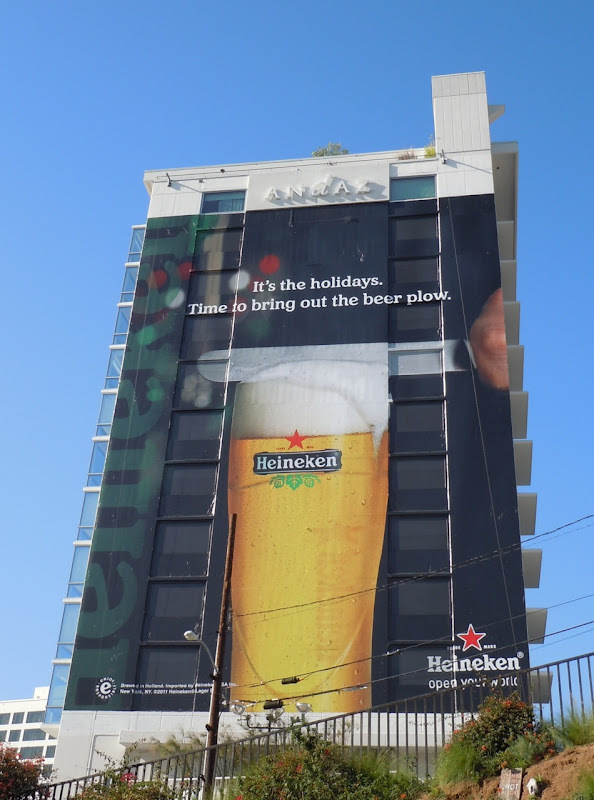 If you do miss the traditional Christmas ads though, check out these Coke Santa billboards from 2010, 2009 and 2008. 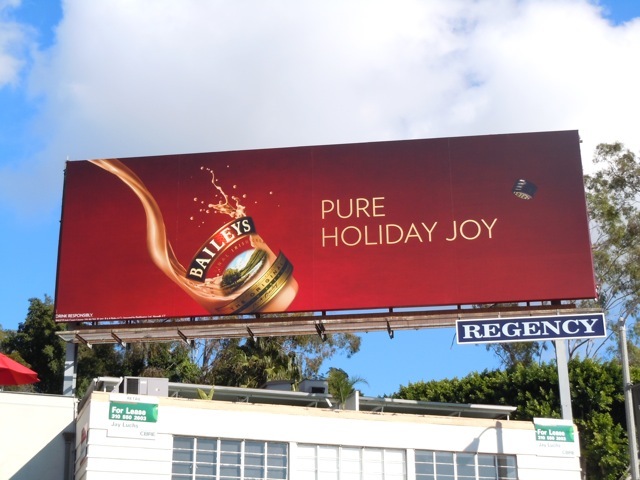 'Tis the season to be merry apparently, with loads of festive drinks billboards lining the skies of L.A. these past two months. 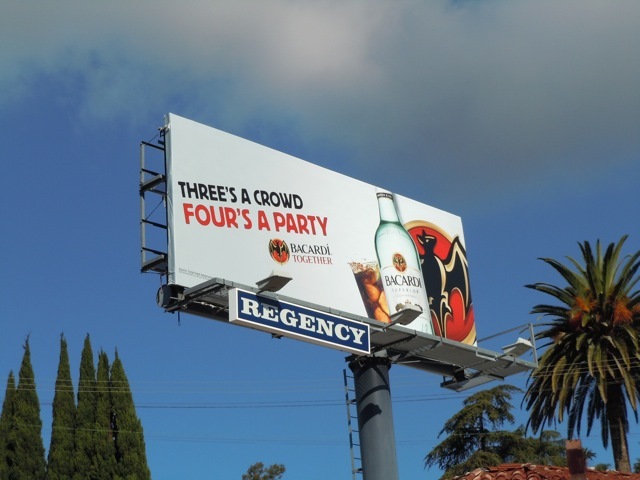 Today's Battle of the billboards sees seasonal favourite Baileys Irish Cream taking on the likes of Bacardi rum and Remy Martin cognac, to win drinkers hard earned cash to toast the Holidays. 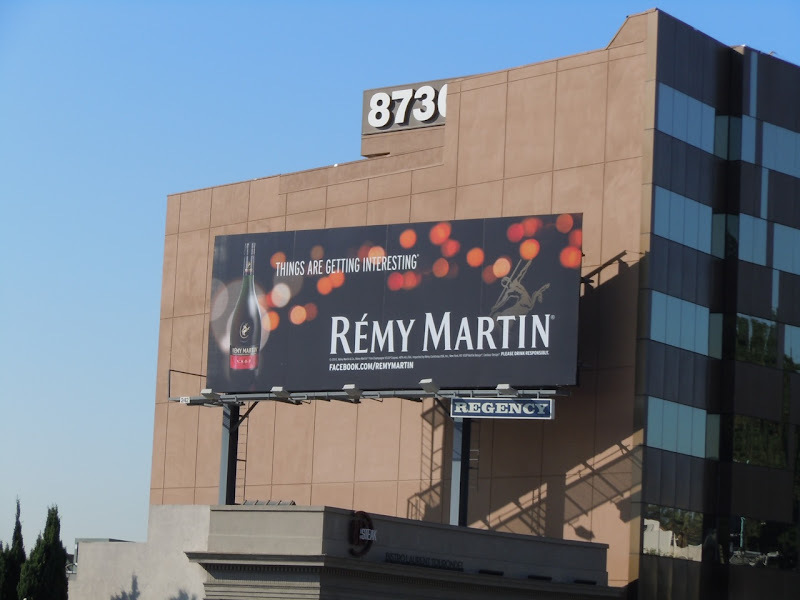 Baileys goes for a clever, indulgent creative to catch people's eyes, whilst Bacardi has some fun with the copy in their ads and Remy Martin goes for a combination twinkling festive lights and celebrity endorsement billboards. 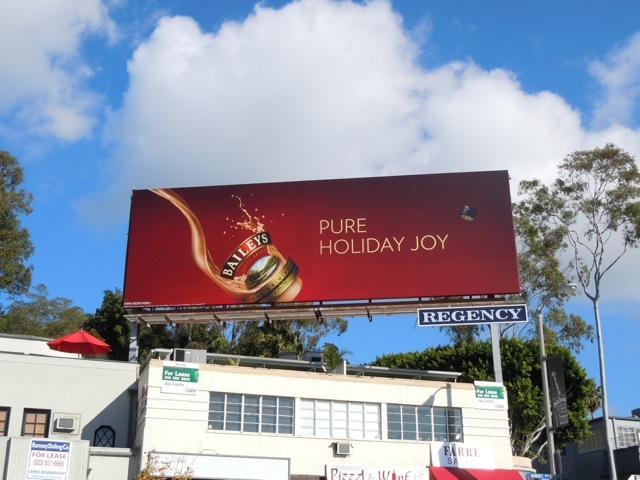 These seasonal Baileys and Bacardi billboards were snapped along Sunset Boulevard on November 21. 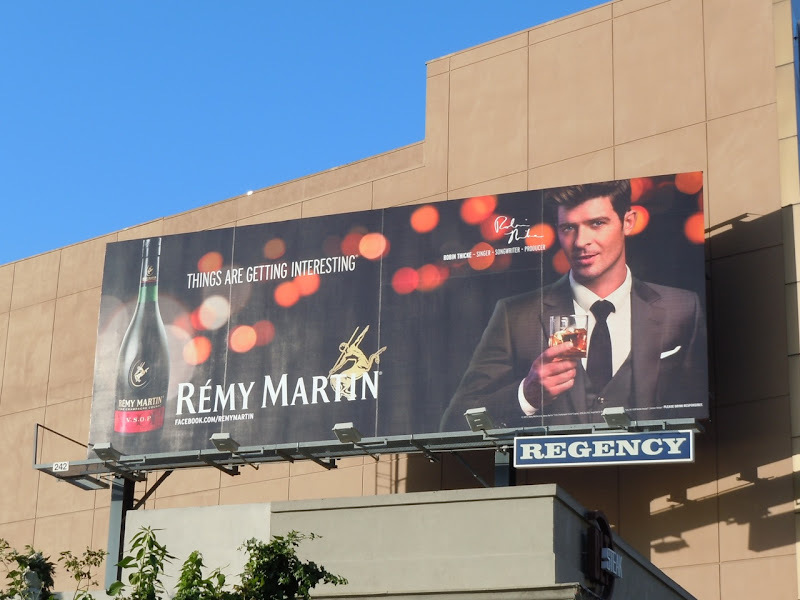 The Remy Martin 'Things are getting interesting' billboard was snapped along Sunset Plaza on October 31, whilst the version featuring the rather sharp looking R&B singer, Robin Thicke, was photographed in the same location on December 2, 2011. UPDATED: Daily Billboard managed to snap this other witty billboard for the festive Bacardi ad campaign. 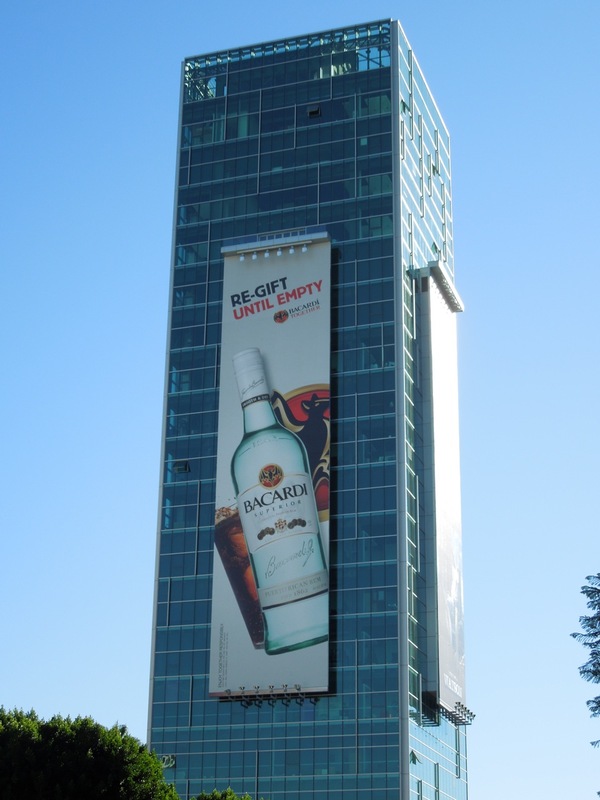 Not only does the giant billboard really catch you eye on the corner of Sunset & Vine in Hollywood, snapped on January 2, 2012, but it's also great fun (and every brand marketers dream it has a full bottle shot of the product). 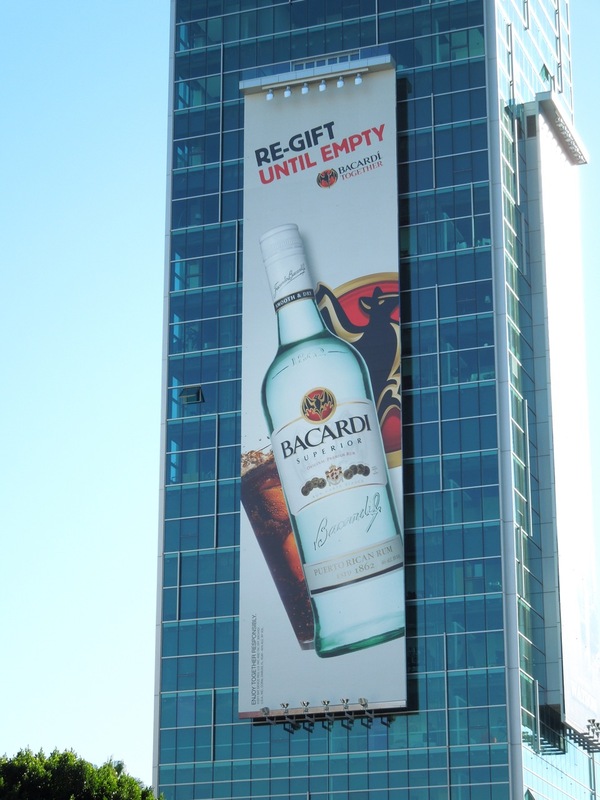 'Re-gift until empty', indeed. Nothing says the holidays like some festive lights and you can imagine the ones at Disneyland are pretty spectacular. 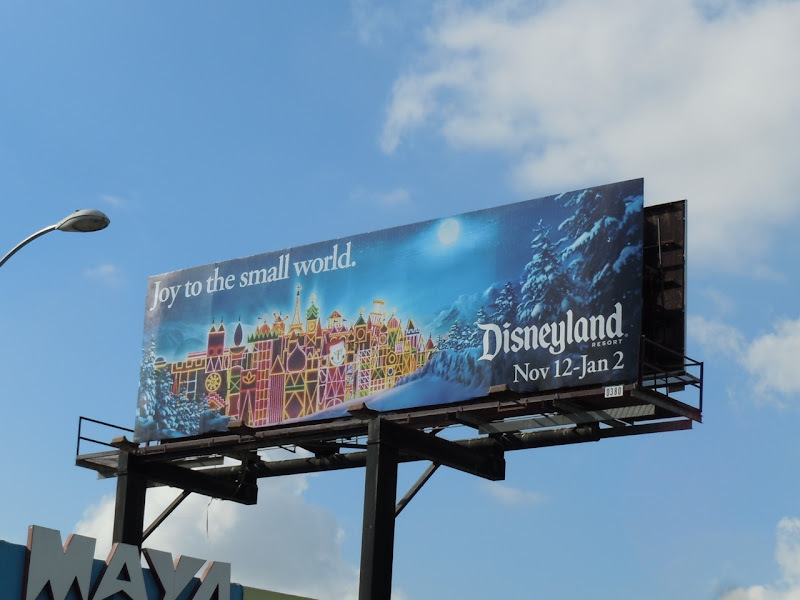 Luckily you don't need to imagine too much, as these billboards of an illuminated fairytale castle and the 'It's a Small World' attraction at Disneyland's Magic Kingdom will help get you in the Christmas spirit. 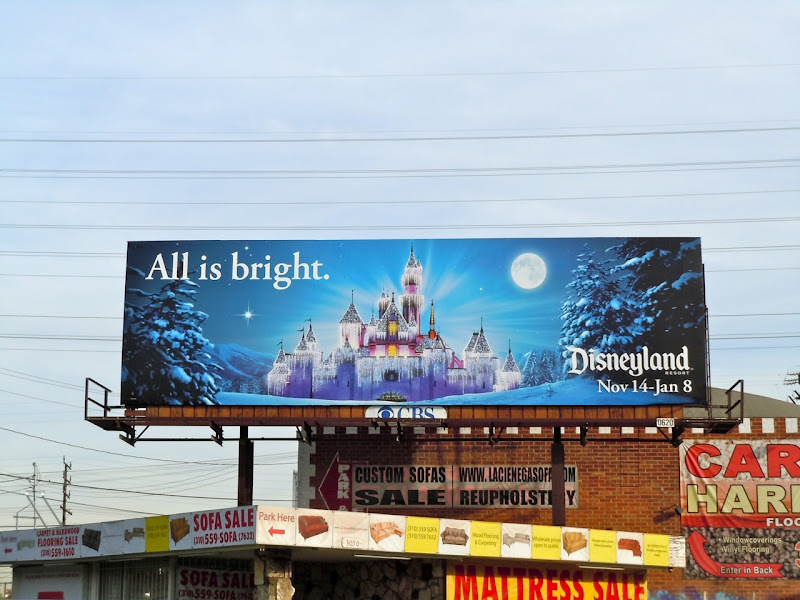 The 'All is bright' creative was snapped along La Cienega Boulevard on November 28, 2011 and the 'Joy to the small world' version captured along Melrose Avenue last year on November 24, 2010. 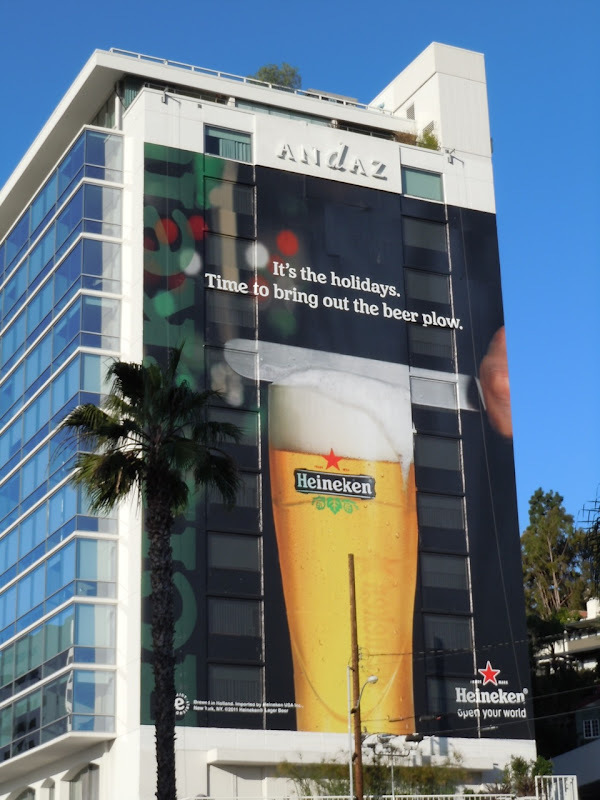 Heineken beer is getting in the festive spirit with these fun new creatives for the holidays. 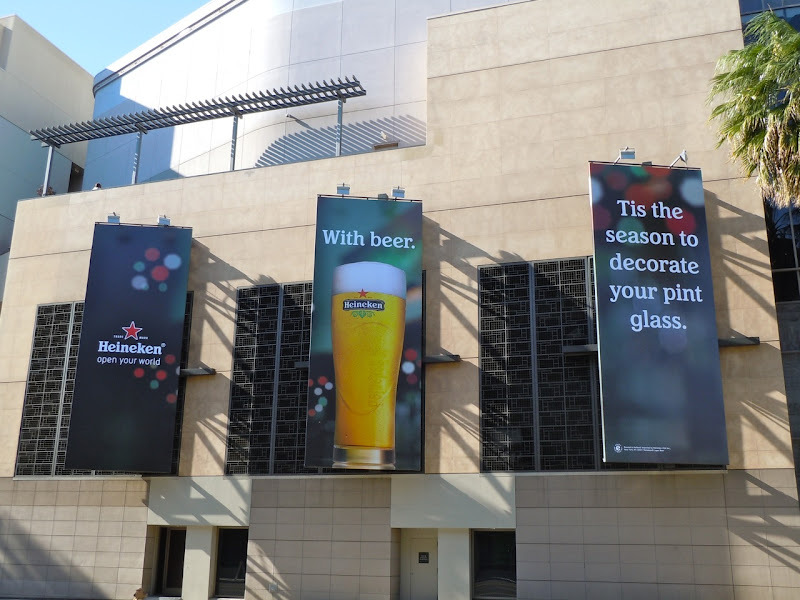 A humorous tagline is always a great way to make an ad more interesting, especially when you're basically just showing a picture of some beer in a pint glass. 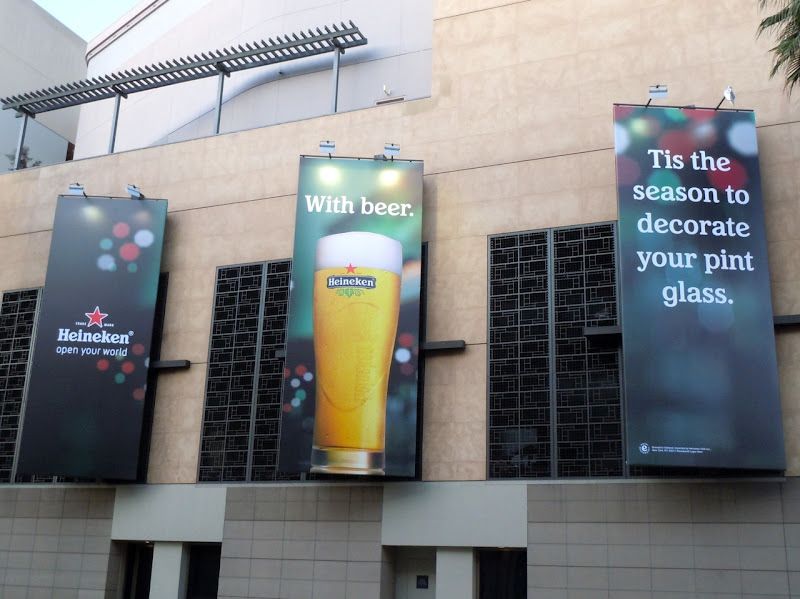 These billboards certainly do a great job of making you want to decorate your pint glass with their brand of beer, and be very merry. 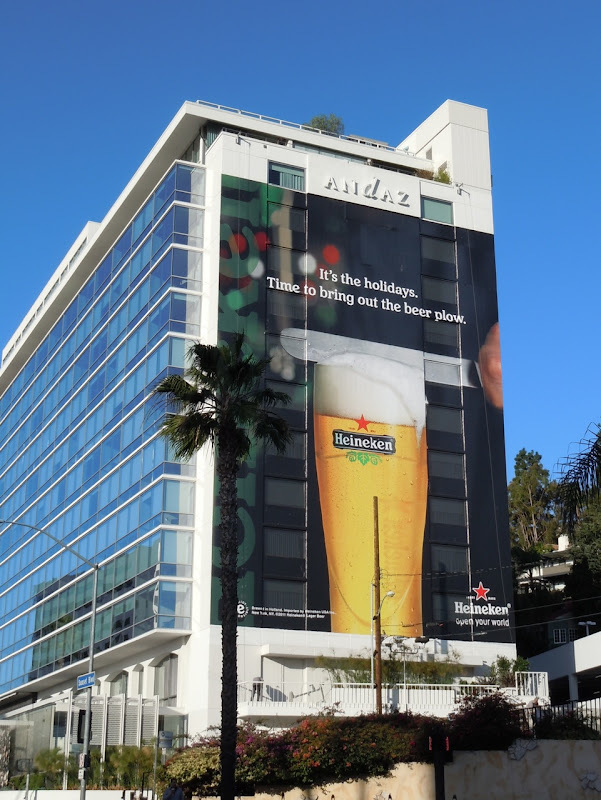 The giant Heineken billboard was photographed on the side of the Andaz Hotel along Sunset Boulevard in West Hollywood, whilst the trio of billboards was snapped along Highland Avenue in Hollywood on December 2, 2011. 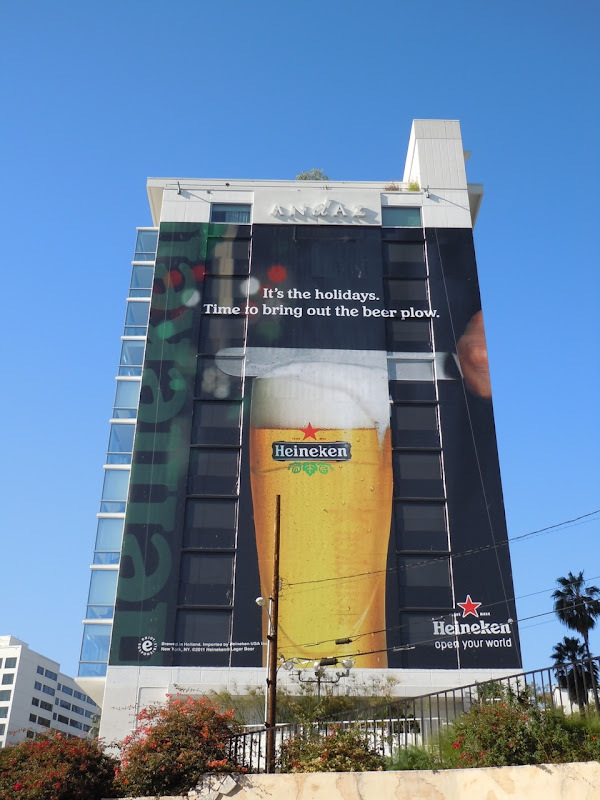 If you like these festive versions, be sure to also check out another giant billboard for Heineken beer from earlier this year. 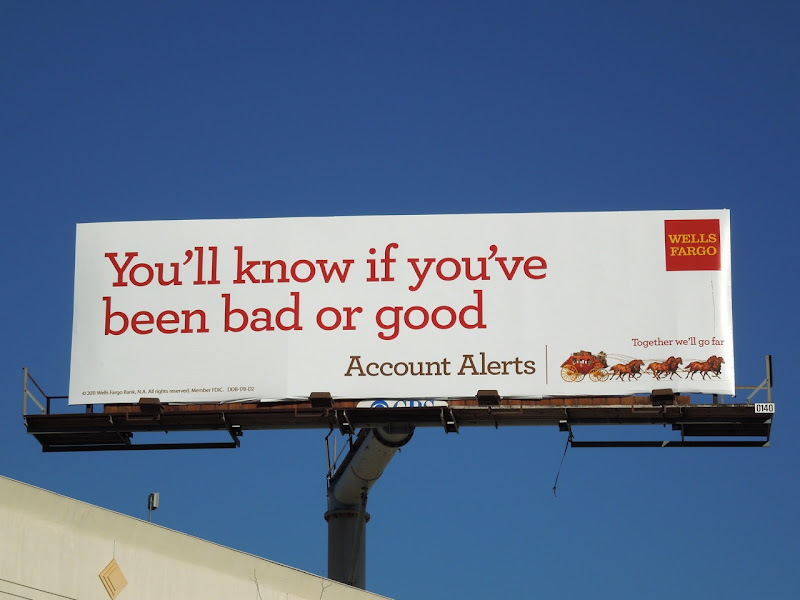 Daily Billboard likes this simple and witty billboard for Wells Fargo banking services. 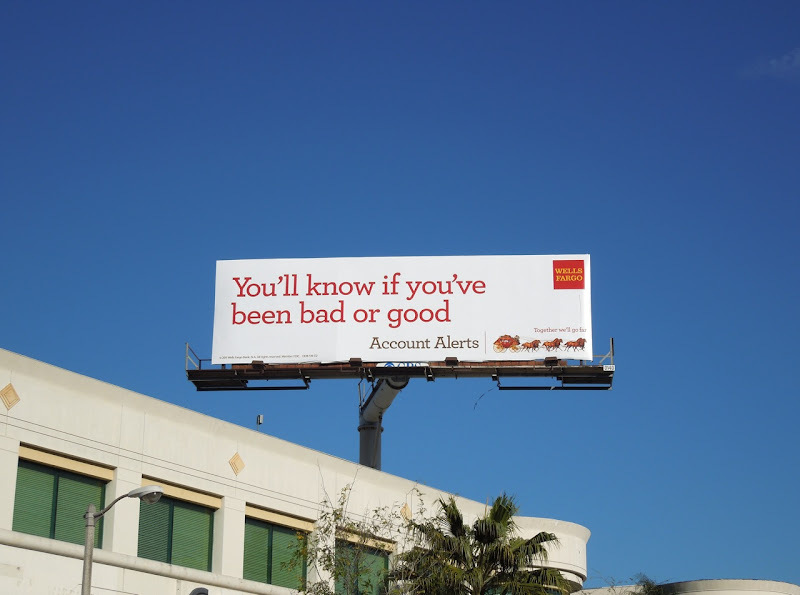 The bank has chosen a fun and timely way to communicate its account alerts features and it's nice to see a corporate bank embracing the holiday spirit. 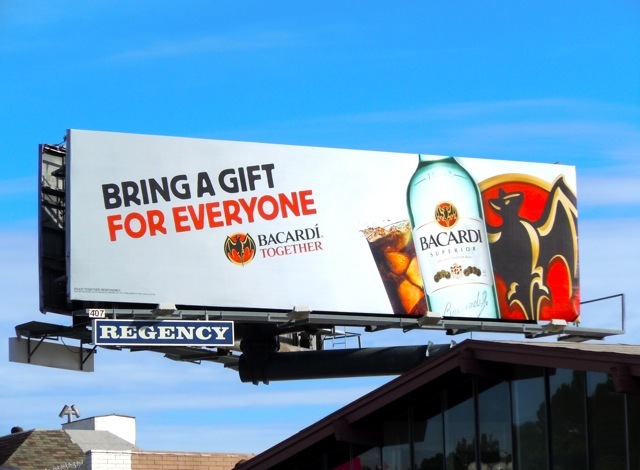 This festive themed billboard was snapped along Ventura Boulevard in Sherman Oaks on December 9, 2011. Have you been bad or good this year?